DELPHOS — Transitioning out of the military is difficult. Going from a regimented schedule and clear, precise directives to the chaos of civilian life can leave former soldiers questioning their next move. Getting out in nature and hiking is a good way to sort one’s thoughts. 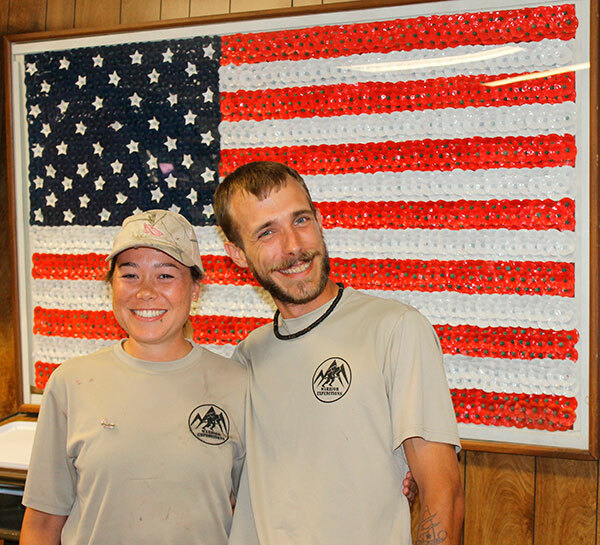 Two veterans, Mei Liber and Preston Hudson, both 31, were treated to a steak dinner and camaraderie on a stop from hiking the Buckeye Trail on Saturday. The pair are part of the Warrior Expedition, a program inspired by Earl Shaffer, who in 1948 told a friend he was going to “walk off the war.” Shaffer was trying to process what he saw, heard and lost during World War II. Four months later, Shaffer became the first person to hike the entire length of the Appalachian Trail from Georgia to Maine. Any veteran who has served in a combat zone and who has been honorably discharged is eligible to submit an application to Warrior Expeditions. Veterans participating in the programs receive the equipment, clothing and supplies required to complete a long distance outdoor expedition in addition to community support from veteran and community organizations located along the route. Delphos VFW Post 3035 is a stop on the Buckeye Trail for veteran hikers. Liber and Hudson had never met before they started the hike but like most veterans, it isn’t hard to find common ground. Liber had dreamed of hiking the Appalachain Trail since she was a small girl. Liber, a Virginia native, is still in the Air Force and is undecided if she will re-up. She joined the Air Force for the same reason most do — to fly. Hudson joined the Marine Infantry, his second choice, because he knew it would be hard. Hudson, who hails from East Liberty, was scheduled to hike the Appalachian Trail in 2018 through Warrior Expedition but changed his plans to hike with Liber when her hiking partner was unable to make the trip. The pair agreed that hiking is a favorite pastime and both are looking for the same thing while out on the trail.